This post has 2,508 views. My four weeks at home have gone very quickly, and last week I took the flight back to the smallish city/town in the US where I’ll start another semester of graduate studies. Just like last winter vacation and the year before that, I spent most of my time at home, relaxing and doing a little bit of research work. I had wanted to go skiing, but I am not really good enough to go on anything other than a bunny hill and I can’t find people to go with me. Plus, skiing near Vancouver is expensive, so I’ll probably do it back in the states where it is less costly. Unlike the previous years, my grandparents were around this winter, and this meant that we ate out more than usual. I had quite a few big meals in Chinese restaurants while I was back home. The food was of course delicious, and I probably ate too much. 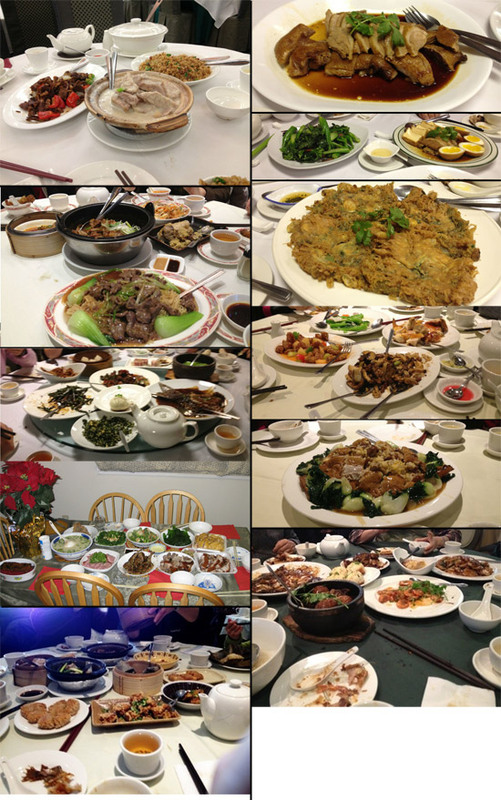 The food was probably the highlight of this winter break and here is a photo collage of some of the dishes I’ve tasted. Needless to say, I probably gained around 5 lbs over the break, but I’m confident I can work it off at school. I’m unlikely to eat so much so often back in the states, and I’ll exercise a lot more when compared to my time at home. That’s pretty much everything worth mentioning, and it’s time for me to get back to the mood for school.